God is the answer for EVERYTHING! I shall tell you a story of yore. Yes, I have discovered the solution, everyone. I have discovered the unifying theory that explains all questions of physics, biology, chemistry, math, history, archaeology, and any field with unknowns: God! Yes, it may seem difficult to comprehend now, but take a look at some examples, and see how well it works! Answer: (a little more difficult) God did it, and we can never understand the mind of God! See? It’s so easy once you understand the Theory of God. There’s no need to think deeply about things anymore. Just accept God into your heart and all will make sense! Ok, the facetiousness ends here. So, I’ve had this issue with believers when I try to discuss anything involving the sciences or the social sciences. The answer of God seems to satisfy them. Never do they notice that this is both a conversation killer and a non-answer. It’s a conversation killer because any discussion beyond this becomes vitriolic since the believer views it as an attack on their God. Needless to say, it both is an attack on their God and is not at the same time. The “attacker” merely wants to get at the truth, and the believer is putting up the barricade of God between the conversation and the truth. It’s a non-answer because it raises the question: what is God, exactly? As an example, if you say that God created the universe, then many questions are raised. Who or what created God? What is God? Is there only one God? Can God be unmade? What is God made of? The believer will tend to say, “God is outside time and space.” This is also a conversation killer. The believer cannot know this because humans are unable to conceive of things outside time or space. The believer is hoping the incomprehensibility of their argument will allow them to win. What a lame way to win an argument. Why is the use of “God did it” so effective? It is effective because it places consensus over logic — the tyranny of the majority. You will rarely hear a believer say “My Baptist God did it, and all other Gods are meaningless.” They just say, “God did it.” What’s the difference? If you shout, “My Baptist God did it and all other Gods are meaningless” into a crowd, you’re likely to get more booing than cheers. 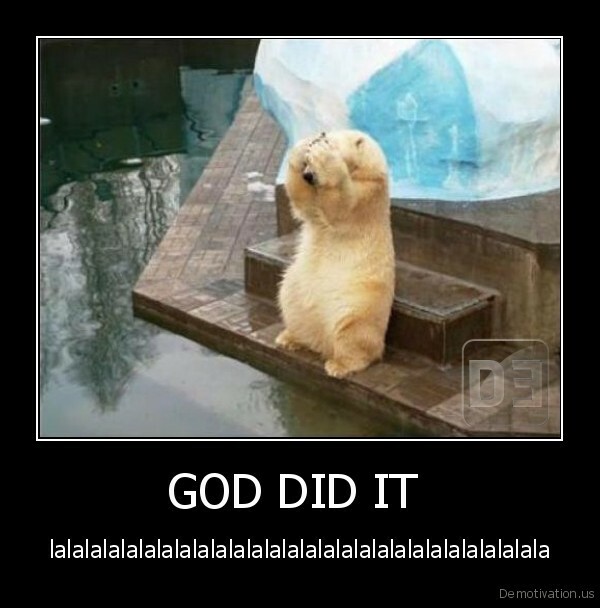 If you say, “God did it” all Christian, Muslims, Sikhs, Jews, Hindus and all other believers will probably cheer. So, this is a false representation of your point. Of course most believers believes that it is their God specifically that is the correct God. Moreover, even if you allow for this false representation, science is not a democracy, sorry. Just because most people believe something to be true, does not make it any more true. So, let’s do a vote (Irony intended)! Who says we should make the phrase, “God did it” illegal in common discourse? (by illegal, I don’t mean go to jail, I just mean, you can’t use it without feeling stupid). P.P.S. Found this funny video, thought it fit in nicely with my article.